As many people who follow me on Twitter know, I’ve been reading numerous books on how to write, and particularly in the past few months, how my doctoral students can write their doctoral dissertations. My goal with all this reading is not only to improve my own writing, but also to learn better techniques to help my students get through the finish line. Doing a PhD isn’t easy and I want to make sure that as a PhD advisor I am doing the best I can. 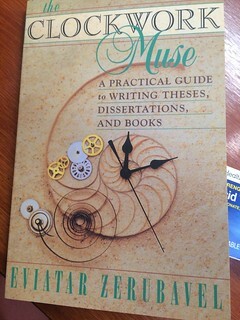 Someone on Twitter recommended The Clockwork Muse: A Practical Guide to Writing Theses, Dissertations, and Books, and I absolutely LOVE IT. The Clockwork Muse is THE PhDJourney book that everyone should read. It’s an incredibly fast and agile read and will help those who write PhD theses-as-books or 3-paper-dissertations. I’m impressed Eviatar Zerubavel is so concise and precise. I wish I had read Zerubavel as a doctoral student, and I keep it handy in my campus office now that I am a professor. And 3) Zerubavel suggests reading down the work in smaller pieces, setting realistic goals and ensuring self-reward when completing those smaller pieces, but always think through the entire book/dissertation/volume. This is super important: the Throughline. One of the most important elements from Zerubavel’s book is his emphasis on what Scandinavian authors call the Red Thread (Pat Thomson discusses this concept in her post, the Red Thread being a coherent line of thought that goes throughout the entire manuscript and makes the argument entirely coherent). William Germano calls it the Throughline. But very few authors of writing volumes seem to place much attention on this idea, that there is one line of argument, one Red Thread or Throughline that should be discernible as you read a book, or dissertation. I’ve only seen Zerubavel and @WmGermano emphasize The Throughline in their books: that coherent thread that travels throughout the dissertation or book, the unifying theme, the one idea that is core/central to the thesis and the book. It’s under-emphasized elsewhere. Strongly recommended, both for doctoral students AND for authors (prospective and published) of books. Tagged with PhD, PhD journey, reading notes.